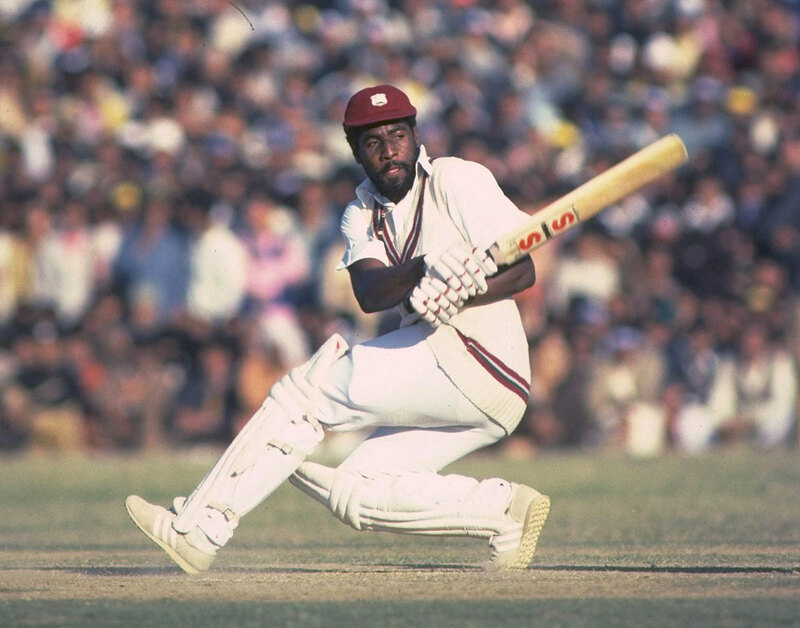 A delirious crowd in St John's, Antigua watched their favourite son, Viv Richards, annihilate England with the fastest recorded century (in terms of balls faced) in Test history - a record that stood for 30 years. It took only 56 balls, and Richards' 110 not out, which came off 58 balls, included seven fours and seven sixes. There was a casual one-handed six over long-on off John Emburey, and another flat, straight one off Ian Botham that took the breath away - and almost Botham's head as well. In Wisden Cricket Monthly, John Thicknesse wrote of "the greatest player in the world in full majestic cry", and of an innings that was "unimaginable, stupendous, awesome, magical". Two days later West Indies completed their second blackwash of England in 18 months, with Roger Harper returning the startling figures of 12-8-10-3. The 240-run victory margin would have been bigger if West Indies hadn't sent down 61 no-balls. Birth of allrounder Manoj Prabhakar, who was a regular in the Indian side in the early 1990s. His bowling was his strongest suit; Prabhakar mixed cunning slower balls with inswing and outswing, and on his day he could be a formidable opponent with the new ball. He once bowled Kepler Wessels for 0 in consecutive Tests - the only ducks Wessels bagged for South Africa in internationals. Generally Prabhakar was a useful lower-order batsman, who was turned into a defensive, platform-laying opener to good effect against England in 1992-93. India won only one of Prabhakar's first 23 Tests, then ten of his last 16, but his career ended in ignominy when he was booed on his home ground in Delhi after getting slaughtered (4-0-47-0) against Sri Lanka in the 1995-96 World Cup. Prabhakar was dropped for the next match and immediately retired. His attempts to implicate others in the match-fixing controversy backfired when he was banned himself for his own alleged involvement. But he returned to cricket in coaching roles in the Ranji Trophy. Another West Indies-England contest in Antigua, and another major milestone - West Indies' highest opening partnership. Gordon Greenidge and Desmond Haynes punished a battered and bruised England for 298 runs, the highest of their four 200-plus stands, and 38 more than England had managed in their entire first innings. Greenidge, in his 100th Test, made 149 and Haynes 167 - nobody else in the whole match got more than Rob Bailey's 42. West Indies, who had all the psychological momentum after their dramatic win in Barbados, bossed this decider from the off and wrapped up an innings victory with four sessions to spare, to take the series 2-1. One of New Zealand's best offspinners is born. John Bracewell's strike rate of a wicket every 82 balls was very respectable for a spinner in the 1980s, when the art was virtually dead. He took three six-fors, all of them in New Zealand's wins, the most famous of which was in Auckland in 1985-86. Bracewell's 6 for 32 helped the Kiwis to a victory that made them the first side to beat Australia in two series in one winter, and he became the first New Zealand spinner to take a ten-for. He could belt the ball too, and in Sydney earlier the same winter he bashed 83 not out in a last-wicket partnership of 124 with Stephen Boock. Bracewell went on to coach Gloucestershire, inspiring them to a series of one-day trophies at the turn of the century. He returned to New Zealand as the national coach in September 2003. He quit the job in 2008 and returned to Gloucestershire, before taking over as Ireland coach for a while in 2015. The West Indian offspinner Jack Noreiga, who was born today, played only four Tests, all against India in 1970-71, when he was called up at the age of 34 to replace the out-of-form Lance Gibbs. He certainly made his mark, though. In the second Test on his home ground in Trinidad, Noreiga took 9 for 95 in the first innings, still the best figures by a West Indian in Tests. He died in Trinidad in 2003. Australia's first captain is born. Dave Gregory, a gritty, middle-order batsman, was at the helm for their first three Tests. He didn't achieve much with the bat, making only one score of note - 43 in defeat in Melbourne in the second Test of 1876-77. In his five Test innings Gregory batted at Nos. 2, 4, 9, 10 and 11. He played for New South Wales, a distinction shared with four of his brothers and three of his nephews. Sandy Bell, born today, opened the bowling for South Africa, sometimes working up a good pace, bringing the ball down from a considerable height and capable of late inswing. He had his best Test figures in his first Test match, at Lord's in 1929, taking 6 for 99. In the same series he shared in the then-South African batting record for the last wicket - 103 with HG Owen-Smith at Headingley. He took 23 wickets in five Tests in Australia in 1931-32, claiming five in an innings in successive Test matches in Sydney, Melbourne and Adelaide. Sri Lanka opener Tharanga Paranavitana, born today, started his Test career with a duck in a match in which Sri Lanka and Pakistan racked up 644 and 765 in their first innings each in Karachi in 2009. During the next Test, in Lahore, he was among the six players injured when terrorists attacked the Sri Lankan bus. He shook off the unfortunate start with two half-centuries when Pakistan visited a few months later. But in his first 32 Tests, Paranavitana only managed two hundreds - at home against India - and after a string of middling scores, he was dropped towards the end of 2012. Daren Powell, born today, started out as a No. 3 batsman and offspinner but moved to medium pace when he came across concrete pitches in school. He made his Test debut in 2002, though he cemented his position only in 2005, when many senior players made themselves unavailable for the first Test against South Africa. In 2006-07 he picked up nine wickets at 27.55 in ODIs and earned a call-up to the World Cup squad, where he turned in a series of sound performances, but he then faded away from the international scene. Manzoor Elahi, born today, played six Tests and 54 ODIs for Pakistan. He scored a half-century each in either format and did little else of note in his ten-year career. His brothers Saleem and Zahoor also played for Pakistan.